Did you know Grammarly has a product for just about every kind of writing you do? We have an online editor for drafting long documents, plus desktop apps and a Microsoft Office add-in if you prefer not to write in your browser. The Grammarly Keyboard for iOS and Android keeps you looking polished even when you’re writing from your phone. And of course, there’s the Grammarly browser extension, which checks your writing on all your favorite websites. How does Grammarly check your writing? Underlying all of Grammarly’s products is a sophisticated artificial intelligence system built to analyze sentences written in English. Grammarly’s team of computational linguists and deep learning engineers designs cutting-edge algorithms that learn the rules and hidden patterns of good writing by analyzing millions of sentences from research corpora. (A corpus is a large collection of text that has been organized and labeled for research and development purposes.) 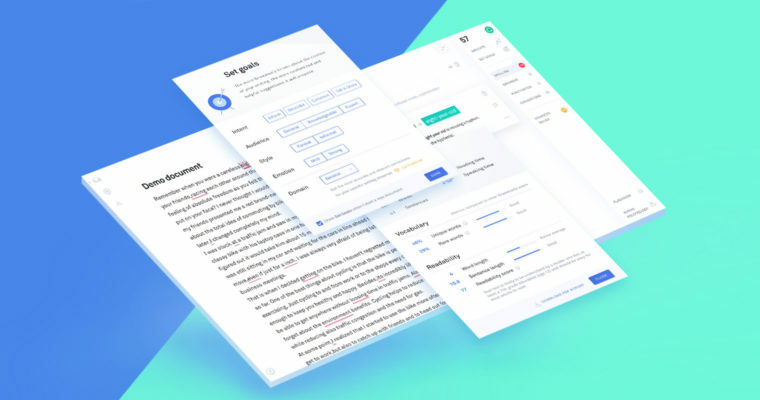 When you write with Grammarly, our AI analyzes each sentence and looks for ways to improve it, whether it’s correcting a verb tense, suggesting a stronger synonym, or offering a clearer sentence structure. As you can imagine, a complex AI system like this one requires a lot of computing power—much more than a personal computer or mobile device can provide. For that reason, it runs in the cloud, rather than locally on your device. All you need to check your writing with a Grammarly product is an Internet connection. When you use Grammarly, you can help improve its suggestions. Anytime you hit “ignore” on an unhelpful suggestion, Grammarly gets a little bit smarter. Over time, our team can make adjustments to the suggestions with high ignore rates to make them more helpful. Grammarly’s earliest breakthroughs in AI-powered writing enhancement happened in the realm of grammar, spelling, and punctuation correction—a fact that’s reflected in our name to this day. We could have stopped there, but the truth is, just because something’s grammatically correct doesn’t mean it’s clear or compelling. Over the years, we’ve continually added new types of feedback to help you fix wordiness, vagueness and hedging, poor word choice, gnarly sentence structure, and even plagiarism. We add new writing checks all the time, so when you see a suggestion you don’t remember encountering before, it’s probably not your imagination. Grammarly’s writing tools are designed to work where you do—on your phone and your computer, in your web browser or your word processor. The difference between Grammarly and built-in spelling and grammar checkers isn’t just accuracy or breadth of feedback. It’s also contextual awareness. After all, an email to your boss probably shouldn’t sound like a text to your best friend. Grammarly’s browser extension, for example, makes stricter grammar corrections and offers suggestions to help you sound more formal and professional when you’re writing on LinkedIn. Grammarly Premium users can adjust their style settings for any text field on any site. When you’re writing something formal, you can switch to the academic or business settings to flag contractions, unclear antecedents, and other casualisms you want to avoid. 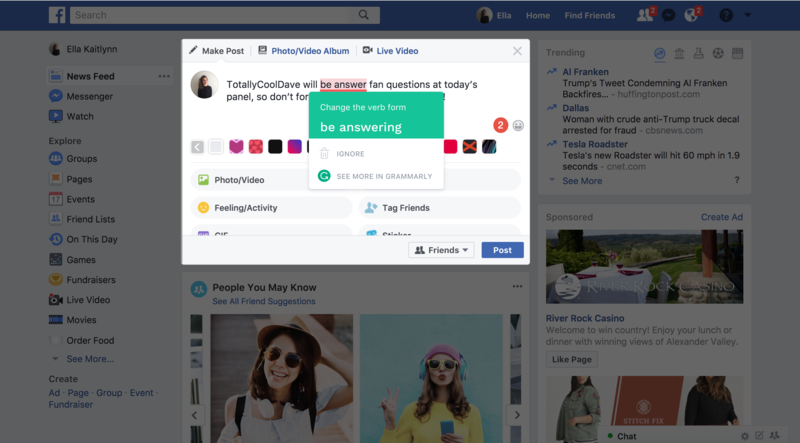 But when you’re posting on Facebook and you want to write in a more relaxed voice, Grammarly’s casual setting will turn off alerts for the passive voice and informalities like slang and sentence fragments. Ready to give it a try? Installation is simple and free. Read on for some helpful tips about Grammarly’s products. When you add the Grammarly extension to your browser, you’ll be able to directly access Grammarly’s writing suggestions from Gmail, LinkedIn, Twitter, Facebook, and most other sites on the web. You’ll know it’s working when you see a green G in the lower right corner of the text field you’re writing in. Basic writing corrections will appear inline, and clicking the green G allows you to open a more robust pop-up editor to access Premium corrections. Adding the Grammarly Keyboard to your iPhone or Android device helps you write clearly and effectively in any app, on any website. So you can say goodbye to textfails, and you can relax when you need to answer an urgent email on the go. If you need to write a longer document, check out the online Grammarly Editor (sign into your account to access it), or download Grammarly’s add-in for MS Office (available for PCs) and native desktop apps (PC and Mac). Our team is working hard to bring you products and features that help you express yourself. 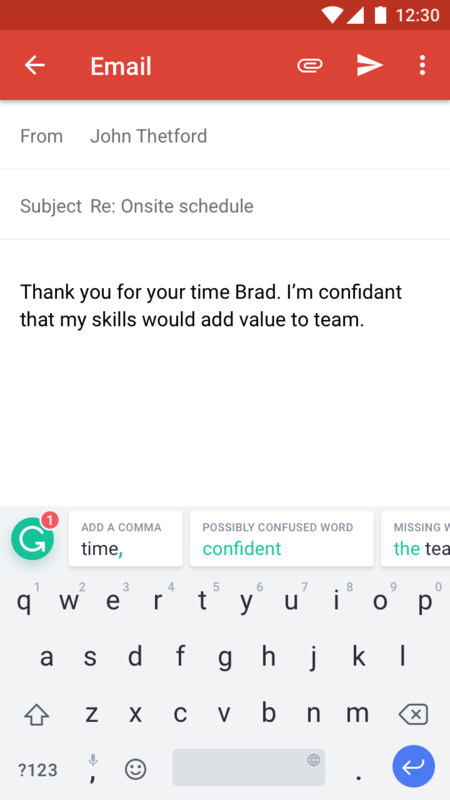 To learn more about what that means and to get an idea of where we’re headed, check out our post about Grammarly’s vision of creating a comprehensive communication assistant.